• The University of Texas Co-op — the most profitable independent college bookstore in the United States — has purchased an Espresso Book Machine. The aim is to revolutionize how the store does business and interacts with the local community. • The store has launched an independent press, is looking at POD textbook solutions, working with local writers, and has plans to revive out-of-print backlist titles for the University of Texas Press. AUSTIN, TEXAS: The Espresso Book Machine® (EMB) is amazing to watch at work. It was named one the best inventions of 2007 by Time Magazine and is becoming increasingly prevalent, though hardly widespread. The latest version of the EBM, version 2.0, can print, bind and trim on demand at the point of sale a library-quality paperback book in four minutes. And with access on the machine to millions of digitized books– from out-of-print books in the public domain to the newest releases from your favorite publishers, as well as the ability to quickly upload new books — the book choice is nearly endless. Just mention this machine to any book lover or bookseller and they begin to imagine a flurry of possibilities. Where it can really shine is in the academic market, as proven by the fifteen or so university bookstores that have implemented machines. Case in point: The University of Texas Co-Op — who is the largest seller of used textbooks in the country and the most profitable independent college bookstore in the United States — recently purchased an EBM for $150,000. 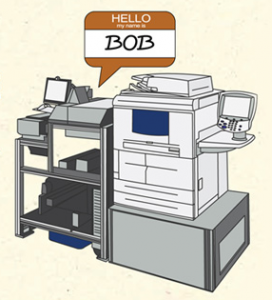 It has created publishing company Forty Acres Press to manage the machine, which has been affectionately named B.O.B: The Burnt Orange Book machine, in honor of the university’s signature color. Chad Stith, who runs Forty Acres Press, is thrilled about testing the possibilities of his “new recruit”, which arrived at the company only a month and a half ago. He sees the B.O.B. as fitting into two main avenues of use: as the main outlet for the new publishing house and as a point-of-sale tool. And because Forty Acres Press publishes and is present in the college bookstore, it is in a unique position within the publishing world to test how B.O.B can be utilized in both circumstances. In addition, The University of Texas libraries hope to benefit from the B.O.B. Chad describes how Forty Acres Press is “working with the libraries and their short-term loan program called the Interlibrary Loan.” The Interlibrary Loan is a regional network of libraries that mail books to each other when students are in need. “We think we will eventually be able to print a fair number of books being called for on interlibrary loan. Rather than having to access the books from a library somewhere else in the region, transporting the book — which is a two or three day delay — and then shipping the book back to its original library, we will be able to print the requested book locally and get the book to the student the next day… plus, the library will then own a copy.” So not only would it remove the time delays for students in getting books, it would also bolster the collection of the library. Aside from the university market, the B.O.B. has seen a large amount of interest from the community-at-large in Austin. “We have begun working with local writers through the Texas Writer’s League to see how they can use the B.O.B.” Chad also says that there has been a great deal of interest from self publishers who hope to use the B.O.B. to print personal books such as family albums, cookbooks, or even a collection of student’s art work that an elementary school class could sell to parents. As discussed above, the B.O.B. is initially expected to be used primarily for running Forty Acres Press, but Stith believes that will eventually shift towards primarily becoming a point of sale tool for the bookstore. With it’s nearly unlimited selection of books, it can eliminate middlemen in the book supply chain. Stith, who helped launch several bookstores, including the now defunct Follett-owned Intellectual Property in Austin, explains, “recent history for booksellers has shown that you can’t afford to put up enough inventory to have an enormous selection of books. The frontlist is just not selling enough to support much investment in a backlist. So this might be an answer to that. Now you can walk into a bookstore, search through a computer’s catalogue of books, and while you drink a cup of coffee, the book you want is printed on demand…a sort of book ATM.” Though the reality of the book-ATM is still a way off, Forty Acres Press hopes to begin testing how the machine could work as a point of purchase tool. Stith is excited to begin the fall semester, “right now, our biggest market is on summer vacation. Once the students and professor return for the fall, we can test B.O.B. in the real world against how we thought we would use it.” With some many different potential functions, time will only tell what the prevalent use of the machine will be. He says, “so far, the biggest challenge is getting the word out about B.O.B.” Rest easy, it sounds like B.O.B. won’t have any problems making friends at his new school. DISCUSS: Could you run a bookstore with just an Espresso Book Machine?